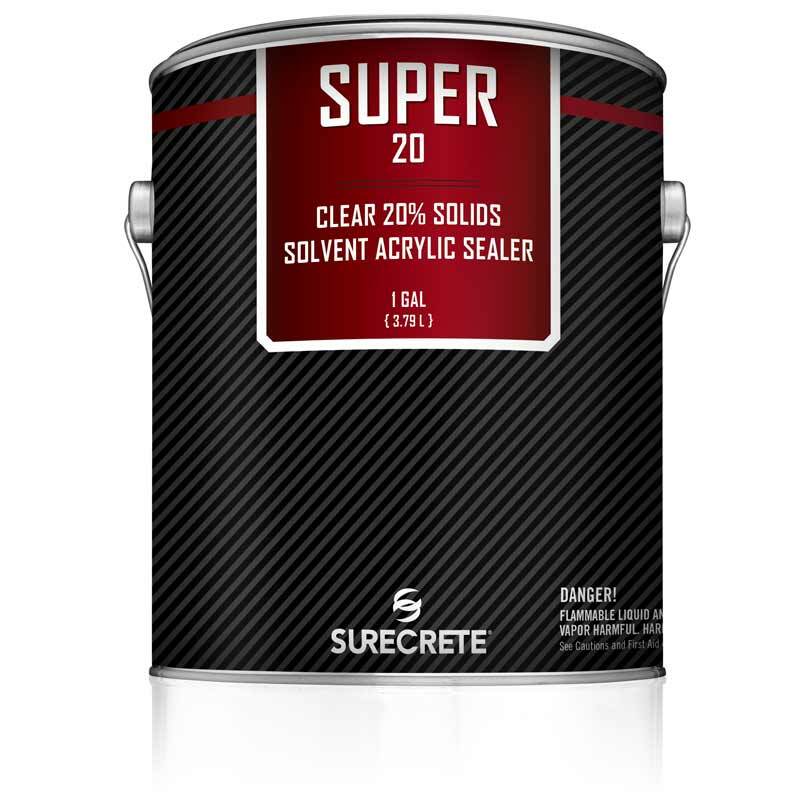 SureCrete’s Super Series ( Super 20 / Super 30 ) exterior concrete clear sealer used to protect existing concrete and cement-based overlays. The Super Series sealer uses quality acrylics to allow for a consistent color enhancement, high gloss finish, and breath-ability that minimizes cloudiness and haziness when moisture is trapped underneath the outdoor concrete. 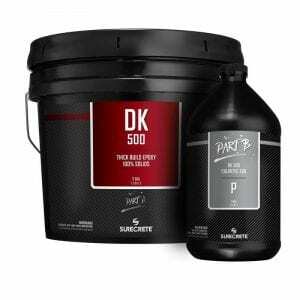 The Super Series is only available for states that allow concrete waterproofing sealers and treatments with VOC up to 600 g/L. If your state follows the Northeast Ozone Transport Commission (OTC) or you live in the state of California, the Super Series is NOT available for use. Please see the HS Series for products that meet the approved VOC laws. 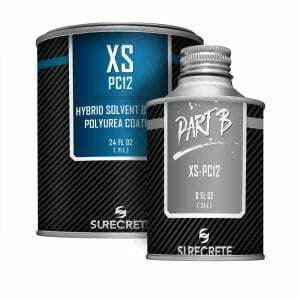 How to Apply SureCrete Super20 / Super30 Outdoor Clear Sealer? Super 20/30 clear acrylic sealer can be applied by roller, airless sprayer or pump-up sprayer. Whatever your application technique, make sure to apply thin, even coats over your surface. 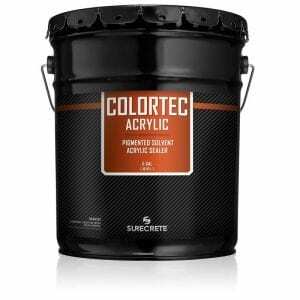 Two coats are typically suggested with any exterior project receiving an acrylic sealer, with the second coat being applied as soon as the first coat can be walked on, and is used in the same manner as the first layer. Question: Can I use just one coat of Outdoor Clear Sealer? Answer: Technically yes, however, it is not suggested. For the best results, we highly recommend using two thinly applied coats of Super Series Acrylic Clear Concrete Sealer. Question: Will Super Series Clear Outdoor Sealer self-level and fill small holes? Answer: No, acrylic concrete sealer products were not designed to meet these application criteria. 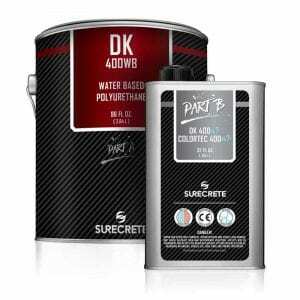 Question: Will SureCrete’s Super Series clear concrete sealers survive the freeze/thaw cycles in my area? Answer: While it is slightly less durable in this regard than our HS Series premium acrylic sealer products, it does still have some moisture-migration-reducing properties. Super 20 is a twenty percent solids, solvent based, crystal clear acrylic, color-enhancing, high gloss finish designed to waterproof, seal, and treat smooth, broomed, and textured concrete exterior surfaces. 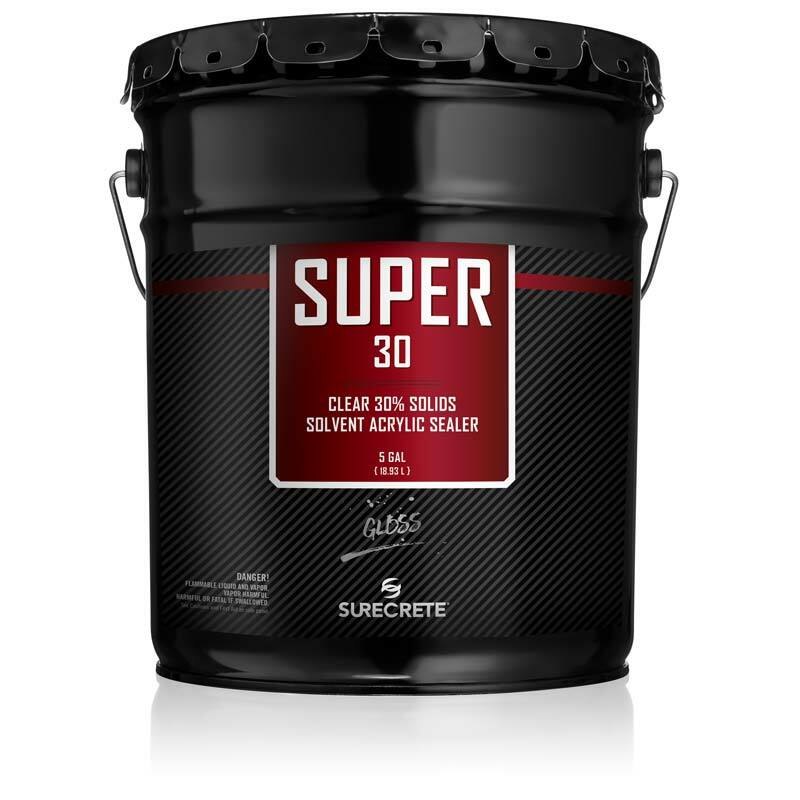 Super 30 is a thirty percent solids, solvent based, crystal clear acrylic, color-enhancing, high gloss finish designed to waterproof, seal, and treat cement-based overlays on exterior surfaces. 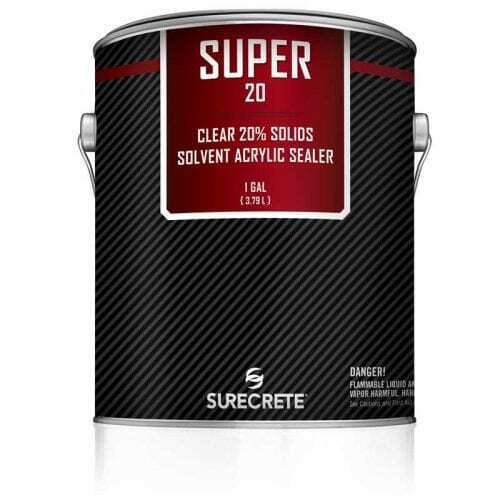 Super 20 is a twenty percent solids, solvent based, crystal clear acrylic, color-enhancing, high gloss finish designed to waterproof, seal, and treat smooth, broom, and textured concrete exterior surfaces.